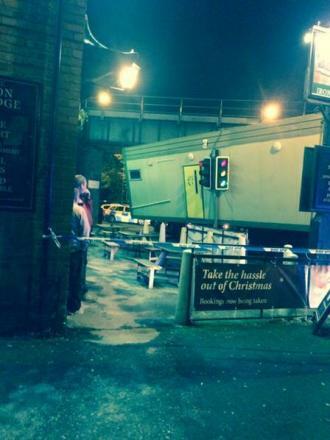 Chester Road in Northwich was closed last night (Tuesday, November 25) after a lorry crashed into the bridge by the Iron Bridge pub in Castle at the junction of Chester Road and Moss Lane. 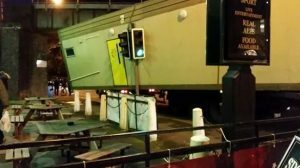 Thankfully no-one is believed to have been injured in the incident but it caused traffic chaos while police closed the road and the lorry was removed. At Stonehewer Moss we believe that the first step to reducing accidents is being aware of accidents, particularly in our local area. Thanks to Michelle Halsall and Darren Halsall who shared these pictures. We will leave you to judge the cause of the accident and how it could have been avoided! This article was added on Wednesday, November 26th, 2014 at 4:48 pm and is categorised under General News, Northwich Accidents, Traffic Accidents. Both comments and pings are currently closed. Error: Error validating access token: Session has expired on Saturday, 09-Mar-19 13:12:58 PST. The current time is Thursday, 25-Apr-19 21:42:24 PDT.